Humidifiers add moisture to the air. Many homes become uncomfortably dry during the winter. Increasing the humidity in a room relieves itchy skin and irritated sinus passages, making the home a more comfortable and pleasant place for all. While pricey electric humidifiers effectively treat large spaces, small rooms can be just as successfully treated with a simple, homemade model created from a naturally absorbent sponge. Turn simple sponges into effective room humidifiers. Spread a gallon-sized plastic freezer bag over a level surface, such as a table or a counter. Puncture the bag with a pair of sharp scissors. Cover the surface of the bag with a series of small holes placed approximately 1 inch apart. 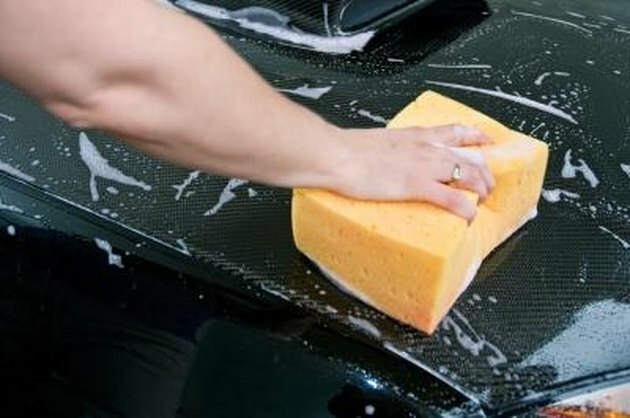 Soak a large car-washing sponge in warm water. Gently squeeze the sponge to remove any excess fluid and then slide the damp sponge into the punctured bag. Seal the bag and place it in an open container that will not be affected by water, such as a plastic basin or large bowl. Set the sponge in the room where the increase in moisture is desired. For large rooms, more than one sponge may be required to reach the preferred humidity level. Remove the sponge from the bag once a day. Place it in the microwave on high for 45 seconds to help prevent the growth of mold or mildew on the surface of the sponge. Re-wet the material and return it to the bag. What Can I Use As a Wick in a Humidifier?